'Main Tera Hero' trailer has already crossed 2 million views on Youtube and has surpassed the record of many blockbusters. ‘Main Tera Hero’ trailer has already crossed 2 million views. Looks like fans have accepted their new age Govinda, Varun Dhawan, wholeheartedly. The trailer of the much awaited film of the year ‘Main Tera Hero’, which was released a week ago on January 23, 2014 has grabbed millions of eyeballs. ‘Main Tera Hero’ trailer has already crossed 2 million views on Youtube and has surpassed the record of many blockbusters. The actor, who is coming with his dad David Dhawan in the film for the first time, reminds you of his dad’s favourite hero. Like all David Dhawan films, ‘Main Tera Hero’ also has everything a typical masala Bollywood film would ask for. From romance to funny and catchy dialogues to action. And not to miss, two stunning beauties Ileana D’Cruz and Nargis Fakhri. 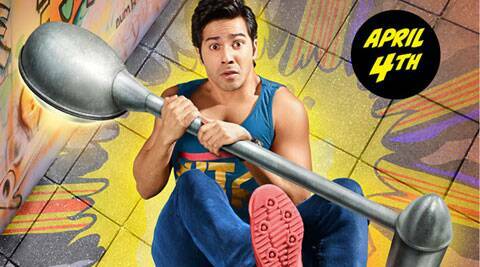 Varun Dhawan plays a college student who hails from a simple family in ‘Main Tera Hero’. As reported earlier, he also underwent a special training for a few action sequences which he will be doing in the film . ‘Main Tera Hero’ is a typical David Dhawan film with lavish sets, witty dialogues and a feel good factor. The film made under Ekta Kapoor’s Balaji productions is set to release on April 4 this year.